“I kind of jumped right into this massive pool of possibilities of what sound can be— how it reacts with us, and how we can react to it,” says Jan St. Werner, pictured at the Metropolitan Waterworks Museum in Chestnut Hill. For over two decades, Mouse on Mars — Jan St. Werner’s electronic music duo with fellow sonic explorer Andi Toma — showcased a brainy experimental sensibility that was also lighthearted and playful. The German group, which began in 1993, quickly attracted a worldwide following. Now, St. Werner, a visiting lecturer at MIT this term, is teaching a fascinating new course titled “Introduction to Sound Creations.” The class is focused on creating and thinking about sound art, a discipline that has, in recent years, gained major currency in the art world. The Mouse on Mars ethos is reflected in St. Werner’s engaging personality — animated and restless, and still brimming with excitement about sound after all these years. Sound is an “unstable art form,” St. Werner explains. “You can’t really compare it with an artwork on a wall or a sculpture. It has sculptural properties; it might trigger associations or revelations, or change your observations. St. Werner’s presence in Cambridge has invigorated the local experimental-music scene, touching off a series of intriguing sonic events in the area. From April 4 until the end of the month, a covert installation will run 24 hours a day at 170 Beacon St. in Boston. Listeners who bring their own radios will be able to tune into an FM-radio transmission based around “Felder,” St. Werner’s new album, issued April 1 on Chicago indie label Thrill Jockey. 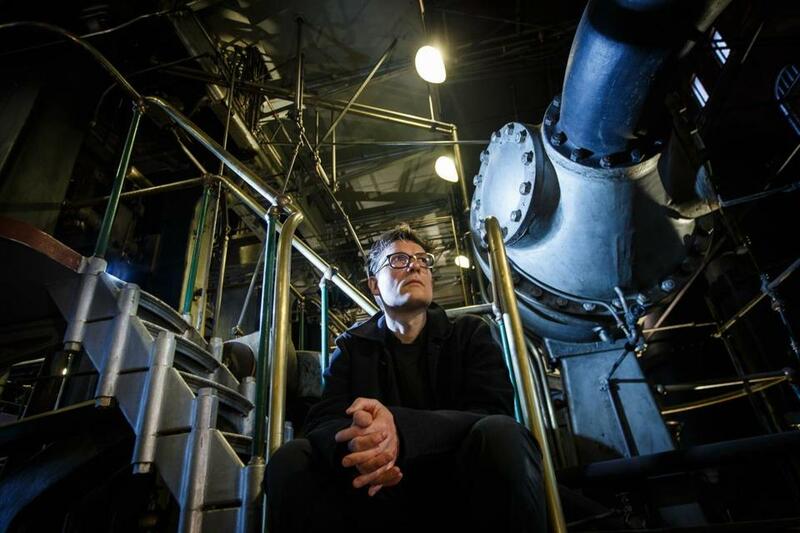 On April 6, the Metropolitan Waterworks Museum in Chestnut Hill — a soaring, massive space filled with vintage steam-powered pumping engines — will unveil its very first sound installation, which St. Werner has cleverly embedded inside one of the engines. Elsewhere, at Mass MoCA in North Adams on April 17, the sound artist Andy Graydon will perform an “intervention” based on “Felder” in the museum. Related events are taking place around the globe throughout the month. St. Werner’s spring course at MIT, taught through the program in Art, Culture, and Technology, continues apace. A typical class might fast-forward from Renaissance philosophy to a discussion of the work of 20th-century American composer Charles Ives. Each student was given a speaker, and has been instructed to build something interesting with it. In May, his students will unveil their final projects — which could take the form of a performance, sound installation, score, or something else entirely. St. Werner is also planning a concert in the Boston area in May with the noted musician Tyondai Braxton, and — quite possibly — a sound installation in a boat on the Charles River. Geeta Dayal can be reached at geeta.dayal@gmail.com.